As mentioned in another article I wrote, I love Partylite products and service. Partylite candles burn so cleanly and completely that cheaper candles just won’t satisfy anymore. The scents are wonderful and the variety provides a favorite for everyone’s unique preference of smell. I’ve been very pleased with the time I needed to go through customer service. 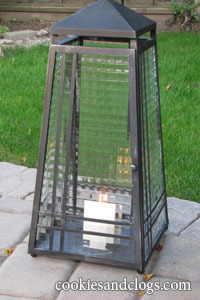 Every season, Partylite has new additions to their line. In choosing an item to review, I decided on the Weathered Zinc Lantern. I had had my eye on this for quite a while. It’s beautiful! The glass panels are such a nice compliment to the rustic look of the metal. The only thing that surprised me was the sheer size of this item. I had no idea it was almost 2 feet tall just based on the stock pictures. You definitely can’t put it on a small patio table. I’m still looking for the perfect spot in my yard for it. Despite its size, it is just a really pretty piece. With the open slots at the top, the lantern stays cool so you don’t have to worry about any little hands getting burned accidentally. It’s of heavy construction if you are concerned about wind or it tipping over. I also like the fact that door has magnets to keep it closed so the door doesn’t swing open when you gently move it. There is a ring on top but, due to the weight of this item, I would not recommend hanging it. I’m glad that they sent the 3×3 Vanilla pillar with it. I’m fairly picky when it comes to fragrances. I like it sweet but not too strong and this fit perfectly with my preference. I love the bit of design on the inside where the candle rests. It’s adds that extra touch to heighten the overall quality. And look at how the light just reflects inside and out! This lantern is listed under the theme ‘country getaway’ but I think it can work in most decors. It’s a great piece that would be perfect for some summer entertaining in the yard. 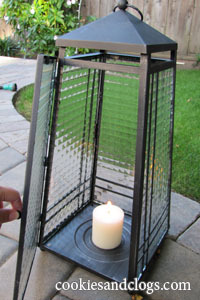 This item usually retails for $99.95 for the lantern alone. If you host a Partylite show that pulls in at least $500, there is sometimes a special where you can buy it at a discounted $35.00. Based on the craftsmanship of the Weathered Zinc Lantern, I think that’s a very reasonable price. ► Giveaway closed, winners announced here! 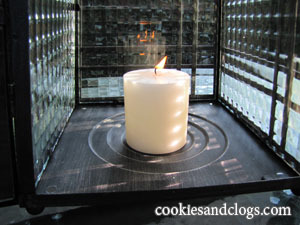 Partylite is generously offering one of my readers 3 dozen tealights in the scent of their choice. Visit Partylite and tell me which fragrances you would choose. “Like” Partylite on Facebook and tell them Cookies & Clogs sent you! Giveaway ends 8/15/10 at 11:59 PST. Open to US residents only. Winners have 48 hours to respond before a new winner is chosen. Disclosure: I was provided with a Partylite Weathered Zinc Lantern at no cost in order to test the product. The review presented here is 100% my honest opinion. I like their margarita glass and pitcher set. I like Party lite on Facebook and told them you sent me! I like Cookies & Clogs on facebook! Three different scents? Hmm. Bamboo Mist, Black Orchid and Clam Waters. I would choose Spiced Vanilla and Strawberry Fields. I would choose the Ocean Berry Breeze scent if I won. I would choose the Icing On The Cake Scent~Strawberry Rhubarb and Home In The Country Scents. Tamboti Safari is my absolute favorite partylite scent! I would choose the Banana Leaf, Honeydew, and Mango Tangerine. I “Liked” Partylite on Facebook. I “Liked” Cookies & Clogs on Facebook. I am now following Cookies & Clogs on Twitter. I am now following Partylite on Twitter. I would choose sun kissed cotton! I follow partylite on twitter! I actually have a bunch of partylite candles already, but my fav has to be the champagne pear. So many to choose from! But i would pick Tropical Waterfall, Home By the Sea, and Bamboo Mist! I “Like” Partylite on FB and left them a comment! Sun Kissed Cotton, Unwind and Island Home all sound like great scents to have around the house! I would choose Tuscan vineyards. I would choose “relax” scent. Mulberry is my ultimate fave! I “Like” Partylite on Facebook. I “Like” Cookies and Clogs on Facebook. I “Liked” Partylite on Facebook and told them Cookies & Clogs sent me! The Partylite fragrance that I like is Mulberry. Love, Love, Love partylite products! My favorite scent would be vanilla. I would choose tropical waterfall scent. I like the island nectar scent! I would choose the tropical waterfall scent. Thanks! I would LOVE Sun Kissed Cotton! I would get Hocus Pocus, French Vanilla, and Ginger Pumpkin! I would love iced snowberries! I have a set of frosted glass tealight holders I bought from them 10 yrs ago at a party!! I would choose Island Home. Kathy N Scott liked and commented on their wall. I would like the Lavendar cake scent. 3. I’m an email subscriber. The three I would select are the Honeydew, Tropical Waterfall and the Island Nectar. Tangelo Mojito and Tuscan Vineyards….mmmm, I can just imagine being there! I would choose the SunKissed Cotton scent… it sounds perfect and clean! I would like to try the new Home in the country fragrance. I would love the Blueberry Wisteria scent !! I would love Vintage Leather, Sun Kissed Cotton, and Icing on the Cake. French vanilla and strawberry fields. Thanks. I would love to try the Island Nectar, Bamboo mist and Home By the Sea Scents. I am a fan of Partylite via Facebook as Jill Myrick and have left a comment. I am following Partylite via Twitter as jlsc123. no place to sign up for the giveaway, bummer!! we so much like to sign up for the free give away as I love Partylite candles & gifts. I have several items in my home from Partylite as well as gifts I give, also candles. Their fragance lasts long after the candle is not lit & burn so cleanly. I love pure vanilla creme, calm waters, & my all time favorite is sun kissed cotton. Smells like fresh lines after drying in the breezy, sunny day. I would choose Arctic Oasis or Patchouli! I would love the Sun Kissed Cotton™ fragrance. I would choose Sun Kissed Cotton™. I would choose Honeydew, Tuscan Vineyards, and Mango Tangerine. I follow PartyLite on Twitter @kristinnw. I would choose the Ocean Mist & Seaside Mist fragances…we went to the beach in June, and I am longing to go back.. I would choose champagne pear and grapefruit fresh. I am torn between the bird of paradise, black orchid, vintage leather, and Tamboti Safari. They all sound so yummy smelling. I follow PartyLite on Twitter @RazzMyBerry . I’d choose the new Bamboo Mist, thanks. I own the Party Lite Lantern and it is one of my favorite things! Friends comment on the beauty and quality of it all the time!